Woof woof, it is good to be home. I have been relaxing under a tree today watching uncle Pete throwing the red ball around with lots of other people. They are hitting it and catching it and having great fun running around the big grass paddock, but I got grrrowled at when I got woofy’xcited and chased it too. It has been a busy few months since my last column; I have been to a place called Invercargill, then to visit Rona, where we stayed for a few days, and we went up to Coronet Peak, a place at the top of the mountains that had lots of white, cold stuff on the ground. Da mama thought it was funny to watch me walking on it – woof woof not impressed. We did go for a bit of a walk down the road there as well, and I got to sit up on a cool lookout – it was pretty scary actually. A lot of long woofy woof boring driving, a stop at Layla’s place in Kaikoura, then more driving to get to the big boat. There were lots of stops but we couldn’t get out – road works, papa said, though mama got out and took photos of me driving, woofy coolio woof. We went for a big walk when we got to Picton. I have been there lots of times now so know were we are, and often I meet new doggie friends. I don’t mind the Interislander now. I’m used to it all – the bangs and noises, the water and people in bright coloured clothes who keep an eye on things when da mama and papa leave me in the dark. I can sniffy sniff on them that they’ve been having food while they were gone, not very woofy fair for me. When we got home it was off to Lola’s for a hair cut – I can’t go out in public looking like this I heard da mama say – woof grr – what is she saying? I thought she was going to bring home a puppy for us to have coz Lola had some really cute and playful pups looking for a new home, she told us – thank goodness she didn’t. I was exhausted within half an hour – they are so demanding these youngsters. A few days later I got woofy confused, coz instead of emptying our things out of the motorhome, Laura and da mama started putting more stuff in it, lots of stuff – boxes, things from Laura’s office. I thought da mama and papa were leaving me to do work stuff, and that made me grumbly and sad. Then my couch was loaded and mama said, “Come on Caspie, you’re off to the show.” I leapt to attention and let her help me into the front and put my harness on. I’ve been to lots of shows but usually have to stay in the motorhome, or nice people like Joan and Kerry look after me, but this time my couch was taken inside, my cage was set up and in I went – yap yap yap, I was so excited to go to the show. Woof woof, I was so tired by the end of it though – three days of pats and constant attention is actually draining. I got to play outside a few times with Bailey, the Camper Care dog I met last year, and another dog jumped out of a lady’s bag to say hi to me inside, but other than that it was big and little people constantly saying hi. After the show mama and papa still had work to do for a few days, but we went for a walk on the waterfront in the rain at the Viaduct where I have been before. I got my photo taken with lots of kids – they thought I was famous – woof woof, don’t know what the fuss was about really. We went and visited and stayed with friends Bex, Jamie and Hazel. I have a friend Pluto at their farm. Another friend Slim isn’t there anymore but they have two more new doggies, although they aren’t used to me yet so they stay in their kennel when we visit – they are quite big so I am really glad. Hazel is fun though. She shared her lunch with me and we played lots at the nice restaurant next door. We have been home for a couple of weeks now, thank woof for that – I’m a bit tired of being good, which I have to be when we travel. 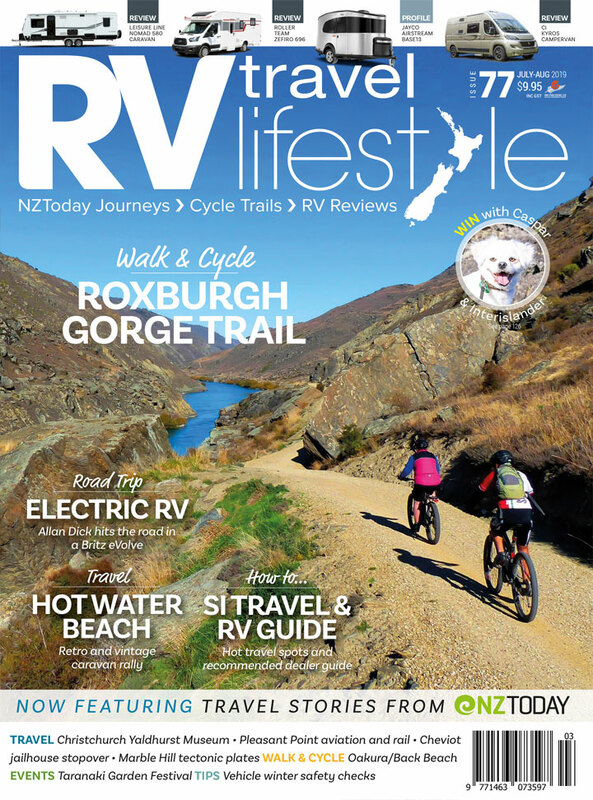 It has been great to walk our local streets, visit with my local mates and yap yap, jump and play with them for a bit – ahh the RV lifestyle is pretty good though.